How do you know when a student has achieved proficiency in a skill or activity? 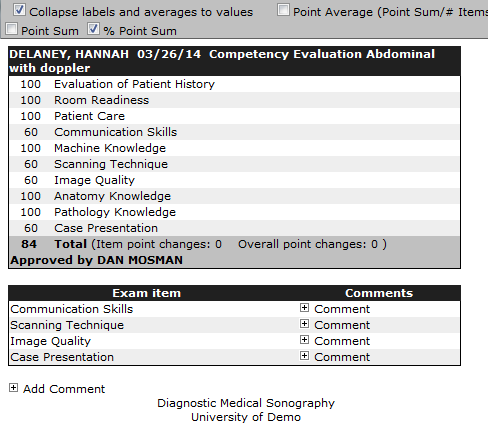 For most health education programs, an assessment by a site-based preceptor or instructor is used to provide feedback to both the student and faculty on a student's current abilities. Whether they are called proficiencies, checkoffs, competencies - and whether they're composed of a single item ("Satisfactory") or dozens - the Trajecsys Report System can support each set of items documenting a student's progress toward professional entry-level abilities. In fact, the report system supports multiple item sets which can remain paired to the same skill or procedure; for example, if a program has a lab competency, a general competency, and a final competency for a single skill, the Trajecsys Report System can provide separate assessments and reports and relate them all to the same skill. Initial setup of all assessments is provided at no charge! Just send us the currently used paperwork and we'll handle the onboarding process.